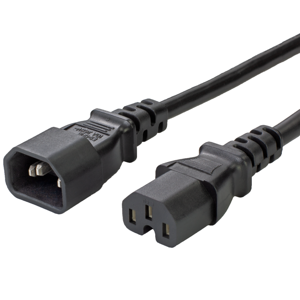 IEC 60320 C14 to C15 Power Cords are available in many standard stock lengths. The C15 is a HIGH TEMPERATURE connector. The maximum pin temperature of the appliance inlet is 120C for the C15. Standard color is black. Standard jacket type is SJT. Standard gauge is 14awg. Standard approvals are UL, CSA (c-UL-us). Colors available are black, white, gray, blue, green, red, yellow, orange. Shielded cords are available upon request. C14 to C15 Power Cord Sets come in three different ampere ratings, 10A, 13A, and 15A. The most common ampere rating for C14 to C15 cord sets is 15A, utilizing 14awg conductors. 14awg C14-C15 cord sets are the most common due to the C15 being a High Temperature (Up to 105°C) connector. Typically, devices that generate significant heat are going to draw more power, making the 15A rating a necessity for most applications. Choosing the correct C14 to C15 power cord set can seem like a daunting task at first glance, between the different amperages, jackets, colors, lengths, and locking styles, there are a multitude of options to choose from. However, continuing to read below will help you make an informed decision on which cable is right for your needs. Choosing a cord set with the correct ampere rating is critical to success. Because devices utilizing C14 inlets operate at a wide range of amperages, C14 to C13 cord sets are available in 10A, 13A, and 15A options. 10 Amp : 10 Ampere rated C14 C15 cord sets utilize 18awg (or 1.00mm2) conductors, and, are the thinnest conductors available. If your equipment operates at less than 10A, and space is a concern, the 10A cable is right for you. 15 Amp : 15 Ampere rated C14 C15 cord sets utilize 14awg conductors, and are a heavy duty option. If you are unsure of how many amperes you equipment requires, or you are simply looking for a heavy duty cable, this is the cable for you. Now that we know what ampere rating is required, we can decide if a locking cord set is best for your application. We will break this section up into three segments : Data Centers, OEMs, and Office/Home USe. First, you'll need to know a little bit about your existing data center infrastructure, mainly what brand and model of PDU you will be connecting these cord sets to. AP8000 Series PDU by APC (Schneider Electric) : If you are using an APC 8000 series PDU, you will want to look into the V-Lock locking cords which will lock on the mating C13 outlet on the PDU. ServerTechnology, Raritan, Vertiv : If you have a ServerTechnology, Raritan, or Vertiv PDU, then the P-Lock (also known as SecureLock) locking power cords are the right choice for you. These will securely lock into place on the PDU ensuring no accidental disconnects. If you are looking for locking cord sets for devices you are manufacturing, our A-Lock (also known as Auto-Lock) cord sets may be the right choice for you. These provide a secure locking mechanism on the female (C15) end of the cable. The A-Lock C15 locks into place by grabbing the grab pin on the mating inlet. The A-Lock unlocks by squeezing the tabs on the size and pulling. Jacket types can be confusing for first time cord set buyers, and as such, we have a full guide to jacket types in our reference section. However, below we will review the jacket types most applicable to C14-C13 cord sets. SJT (Service Junior Thermoplastic) - The SJT jacket is a thicker jacket than SVT, and is the standard jacket type for C14-C13 cord sets. The SJT jacket is available with 18awg (10A), 16awg (13A), or 14awg (15A) conductors. Please refer to each specific category for more information. LSZH (Low Smoke Zero Halogen) - The LSZH jacket is made for use where smoke could cause damage to humans or equipment. Normal PVC jackets (such as SVT and SJT) contain Halogens, which when burned, product heavy toxic smoke that can be fatal to humans and damaging to equipment. LSZH jackets contain "zero" halogen (in reality it is a defined maximum amount of halogens to be classified as "zero" halogen"), and produce significantly less smoke when burned. These are commonly used in government buildings and wherever these cord sets will be used in public areas. LSZH jackets have significantly less flexibility than SJT jackets.